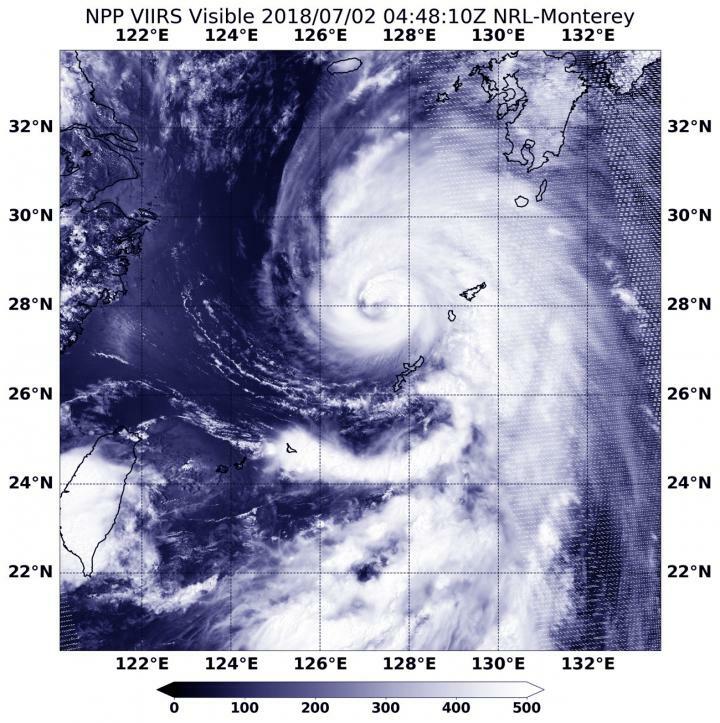 Tropical Cyclone Prapiroon strengthened into a Typhoon as NASA-NOAA's Suomi NPP satellite passed over the East China Sea in the Northwestern Pacific Ocean. On June 6 at 2:42 p.m. EDT (1842 UTC) the Visible Infrared Imaging Radiometer Suite (VIIRS) instrument aboard NASA-NOAA's Suomi NPP satellite captured visible image of Prapiroon. VIIRS is a scanning radiometer That means as the satellite orbits the Earth, VIIRS scans a swath that is ~3040 km wide (the cross-track direction). The VIIRS image showed that Prapiroon's center was located between Taiwan to the southwest and the big island of Japan to the northeast. VIIRS showed a powerful band of thunderstorms wrapping into the low-level center from the north and east. A large band of thunderstorms extended around the eastern quadrant of the storm, from north to south. On July 2 at 11 a.m. EDT (1500 UTC) Typhoon Prapiroon's center was located near 28.2 degrees north latitude and 127.3 degrees east longitude. That's approximately 105 nautical miles north-northwest of Kadena Air Base, Okinawa Island, Japan. Prapiroon was moving to the north-northeast at 10.3 mph (9 knots/16.6 kph). Maximum sustained winds 86.3 mph (75 knots/139 kph). The Joint Typhoon Warning Center or JTWC noted Prapiroon is now moving north and will maintain current strength for 24 hours before making landfall in South Korea and moving north into the Sea of Japan.